Plymothian Transit: Now thats better! Having posted about the poor display at St Budeaux the other day, this is more like it! I actually took this photo when it was displayed on one of the Enviro buses prior to their being placed in service by Citybus. It shows almost everything you need when trying to catch a bus. The map is great to see exactly where the bus is going, the times and neatly displayed and also the RTP panel giving the bus stop number to text in. In some ways this is an easy bus stop as all the buses from it go pretty much the same way but there is no real reason (apart from a lot of time and effort needed!) why it cant be the same at most bus stops. The map could always be a bit smaller if there are lots of service and more than the one bus company serving the stop. Derriford Hospital is perhaps one of the exceptions where lots of buses go in all different directions but I am sure it would be worth the effort. The killer statement here is of course - a lot of time and effort - and that also means money - but all our local bus companies and the City Council have already shown us what they can achieve when they put the time, effort and money in: this type of timetable display is just another example of that commitment being worked out in practice. The lack of route descriptors is becoming endemic of UK public transport, I went to Coventry last week and looked up the service I needed on the website, but by the time I got to the bus stop I had forgotten which way the bus went, with just a list of departures at the stop to help. seen some of the maps on royal parade when out and about. Mainly on A17,18 and 19! also have you noticed the mistake on the board on top of the A17 bus stop? it says VIADUCT A17 instead of ROYAL PARADE A17! You have to remember that this board was produced for a bus stop on Royal Parade where the 75% operator and the 25% operator have a timetable case each. Much easier to come up with a tidy product when other people are not opening the case up and moving things around to make room or to suit them. You also need to remember that Target usually only have one service to advertise on a stop and so it is easy for them. FDC have only 25% of services and can therefore exploit the additional room that this gives them in the space available. What should happen is that the Council should produce unbiased multi operator passenger information to a suitable standard. But of course that means the Council spending money, so it will not happen. 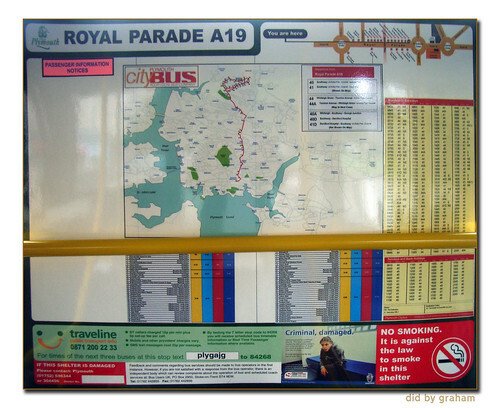 The operators are left with the job of updating the 1800 bus stops in Plymouth alone. Yes things could be better - but look around the country and you will discover that the South West is reasonably good at providing passenger information. If you look around Cornwall FDC publicity is poor and often out of date, Western Greyhound's is smart modern, colourful, and accurate. It can be done.